Oktoberfest is renowned world wide and is held annually in the German city of Munich, Bavaria, for a fun-packed 16 days. Despite its name it starts in mid September though it does “spill over” (literally I would imagine) to the first weekend of October! I haven’t actually been to Munich or the Oktoberfest celebrations there though we are planning to remedy the former by visiting Munich and Bavaria next April. We won’t be there at the right time to experience the festivities of Oktoberfest though and I can’t honestly say I’m too disappointed by this! 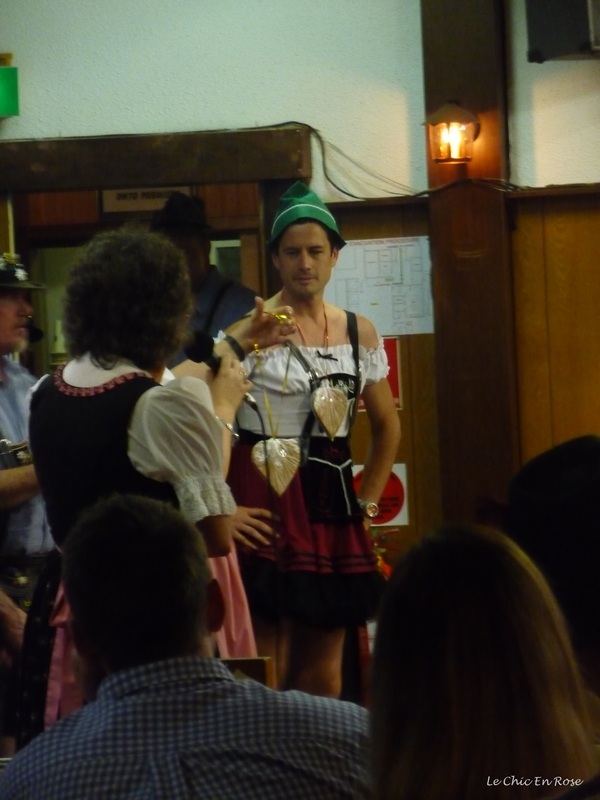 However I did have the opportunity to go along to the Oktoberfest evening at the Rhein – Donau Club in Perth last week along with my German Language Class Group. 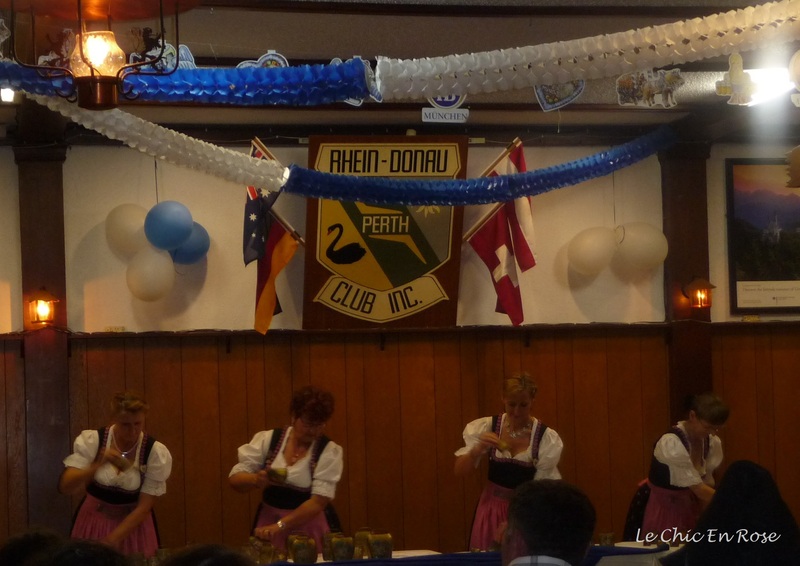 The Rhein-Donau Club (Inc.) was established in Perth in the late 1950’s and has been based at its present premises in the southern suburb of Myaree since 1959. The idea was to provide a facility and meeting place for people of German speaking backgrounds in Perth (that includes Germany, Austria and Switzerland) plus anyone else interested in German heritage, culture, cuisine and traditions. Hence the name is a combination of the two major central European rivers the Rhein (Rhine) and the Danube (Donau). Now I knew that I had a family connection by marriage to the Rhein – Donau Club as my son-in-law’s grandfather (or Opa) was an active member for many years. I didn’t realise until last week however, through talking to my daughter’s mother-in-law (and Opa’s daughter – with me?) that her father was actually a founding member of the club. He emigrated to Perth with his wife after the Second World War from Austria. For many years he and his wife and family were an integral part of the Rhein – Donau community. He was on many committees and even managed the bar there for a while! They practically lived at the club at weekends and his daughters all had their wedding receptions there. So it was rather a happy coincidence that I found myself at the Rhein – Donau Club for their annual Oktoberfest celebrations this year. Since my son -in-law’s “Opa” sadly passed away a few years ago this is a pictorial tribute to Oktoberfest in Perth which I hope would have done him proud! First things first, food and drink! I was slightly apprehensive as I’m not a huge fan of traditional German fayre such as bratwurst nor do I like beer. I had heard that at the Munich festival a request for a glass of wine or even worse, water, was likely to be met with horror. However I’m pleased to report that here in Perth, the catering committee of the Rhein Donau Club had thought of everyone and there was a good selection of both food and beverages on offer. We had been told to expect traditional entertainment so were a little puzzled when we were treated to a local duo (admittedly dressed the part in traditional Bavarian hats) belting out cover versions of old rock songs: “Rockin All Over The World” by Status Quo, “I’m A Believer” by the Monkees and even “Que Sera, Sera”, which was an interesting choice of language to say the least. However according to the promotional blurb they do have a Germanic name “Die Lustigen Jungs” which translates into English as “the funny guys” so I think it was all very much tongue in cheek! In due course the Master Of Ceremonies announced the traditional entertainment and the dirndl clad ladies of the “Echo der Berge” or Bell Ringers began with renditions of various traditional German songs such as “Edelweiss” culminating in a wonderful performance of “Waltzing Matilda” (a symbolic gesture to Oktoberfest in Australia). Though they made it look easy, I think it would actually take hours of practice and a good deal of skill to play the bells as well as they did! Next came the Edelweiss Dance Group which included some vigorous thigh slapping by the male dancers (all above board!). And a “best dressed” dirndl parade with some interesting costumes and participants! The winner was chosen by the audience! Winner of the best dressed dirndl competition! Finally there was the “Stein” holding contest which requires considerable strength! 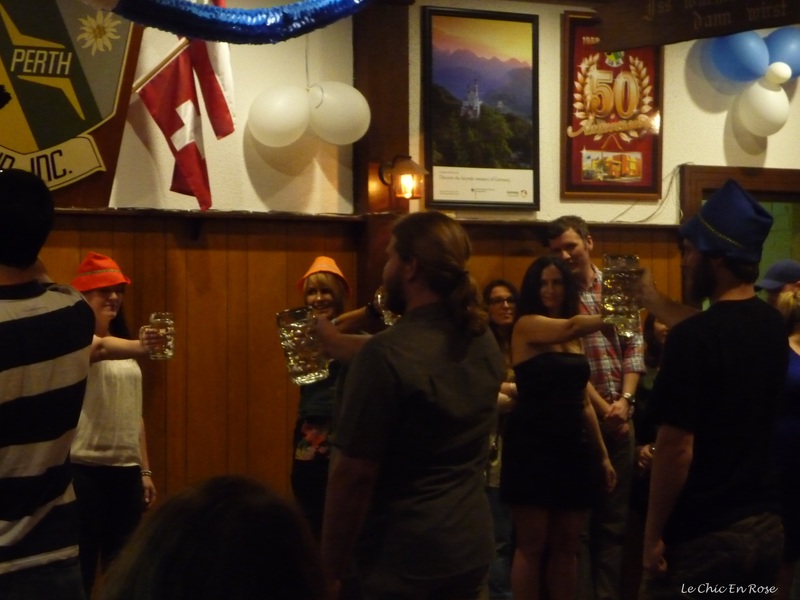 The rules are as follows: Contestants must hold a 1-litre glass stein (half litre for the ladies) filled to the top with beer with their arm outstretched for as long as possible. The arm cannot be bent and must (hopefully) remain parallel to the floor. Any beer spillage results in disqualification. The winner is the last man and woman still standing, with their arm straight out ahead and their stein still full. Incredible to think that the waiters and waitresses in Munich are expected to be able to carry a few of these all at once. Although I didn’t take part in the competition I am reliably told each stein is very heavy even when empty! My audience participation was limited to linking arms and swaying along (schunkeln) to the traditional beer songs! The Rhein Donau Club holds Oktoberfest evenings every Friday and Saturday throughout October and the beginning of November culminating this year with an Oktoberfest Family Day on Sunday November 2nd 2014 with free admission from 2 – 6 pm. The rest of the evenings cost $10 admission for members and $15 per person for guests. In addition to the food and entertainment, some of the groups that meet regularly at the club, put on exhibitions. The Rhein Donau European Model Railway Group’s was outstanding! The Schuetzengruppe (Air Rifle Group) had organised a shooting gallery round the back (with blanks only)! The Schiess Bude (Shooting Gallery) make sure you get the “i” and the “e” the correct way round or it means something quite different not for polite company! The Schuetzengruppe (Air Rifle Group) organise a shooting gallery with blanks! Schnaps spelt correctly 1 “p” only I found out! And there you have it – Oktoberfest “Down Under”! I thoroughly enjoyed my experience and would definitely go again next year. How about everyone else? Has anyone got any interesting Oktoberfest experiences to share and if you’ve been to the actual festival in Munich how did you find it? Bis naechste Woche! Auf wiedersehen! Tschuess! I just read your latest blog post. 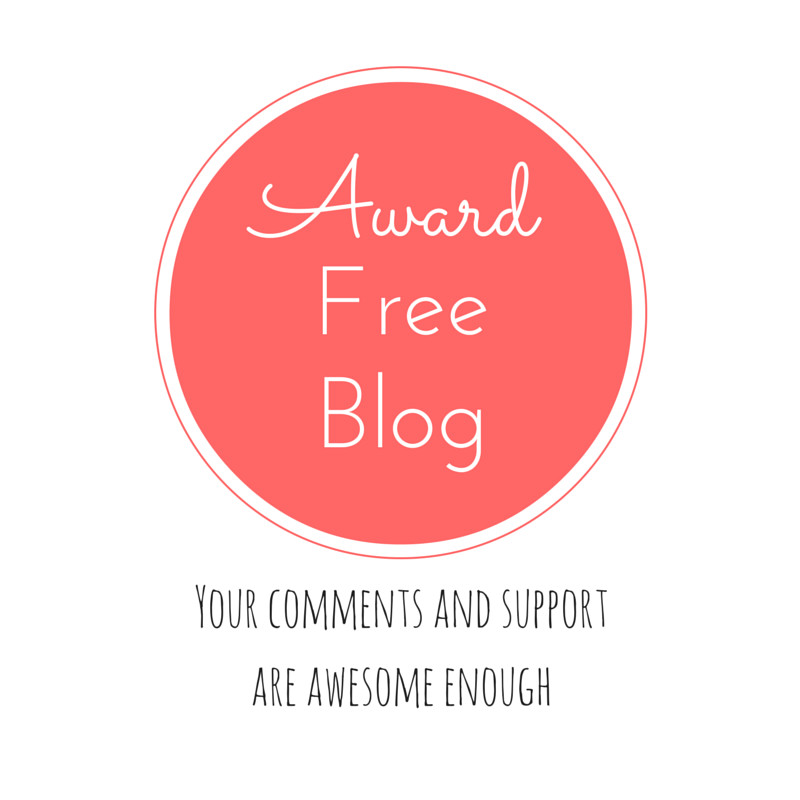 Great photos and well written! I just wanted to point out the arm-linking action is not called ‘schaukeln’, it’s ‘schunkeln’. I don’t understand why you would get mixed reviews of Christmas Markets as they are a lot of fun, especially in Germany as they originate from there. There are actually multiple markets throughout the city and it is great fun to wander through them. We did a post on it: Munich Christmas Spirit. You can also see Munich in Photos. We were there only for 2 days so didn’t get a chance to explore everything. I had been previously on a business trip and had gone to Dachau (one of the Nazi concentration camps) and it was a very sobering experience. If you have the stomach for it I would highly recommend it. Munich also has a number of wonderful museums that are well worth a visit. I believe the surrounding areas are also worth a visit. I hope this helps. This sounds great fun Rosemary, seems like they got the atmosphere and everything else spot on. I’ve never been to the Oktoberfest despite spending a year living near Munich!! Have been to the beer halls though and I always find it unbelievable how the waitresses can hoist a huge number of steins up in the air, I struggle with one!! I’ve never been in Oktoberfest but once I saw a stein that someone bought in Germany and I can confirm it is very heavy! Looks like fun! My in-laws have been to Oktoberfest a few times and really enjoyed it, they have quite the collection of mugs! I would love to go sometime, perhaps when the boys are older!